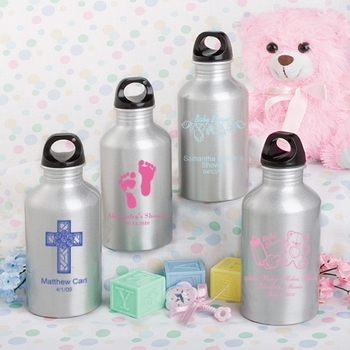 Quench your thirst for the perfect party favor with these stylish custom-made water bottles. This is truly a unique idea that is fun for all occasions. This bottle has a tough metal exterior and is perfect for travel, outdoors and the adventurer. Each bottle measures 7 1/4 by 2 1/2 inches and is able to be filled with 13.53 ounces. Each one has a shiny silver metallic finish, a black screw-on top for a secure seal. Packaged in poly-bags to prevent scratches. The finish is specifically designed for silk screening your favor theme, picture, and color. Create your own masterpiece that you can view online before ordering. You choose from a wide variety of all occasion themes, colors, designs and titles that you can see as you design it through our online animation feature that also allows you to see exactly what it will look like! Minimum order is 30 and free shipping is included. PLEASE NOTE: A $35.00 screen printing set up charge per design will be added to your order. This is charged by the screen printer for the creation of your design, the making of the silk screen and the set-up of the printing machine. Personalizing your bottles is easy! Just click the button to the right of the item photo to open the Custom Bottle Designer. After you create your design, click the "Use This Design" button which will automatically fill your design choices into the boxes on the right. Note: If it doesn't open, you may need to disable any popup blockers. Call 866-476-0213 if you have any questions at all. Processing Time 2 Weeks. Does not include shipping time. Please read the description under the photo before designing your bottles.